The McHale range of blockcutters will efficiently cut neat, compact silage blocks every time. The McHale range of block cutters is powered by two hydraulic rams. 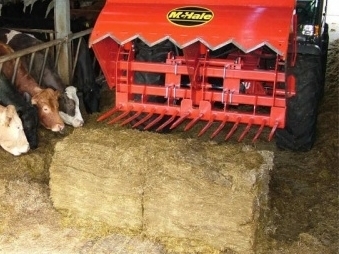 All McHale blockcutters have a uniquely designed serrated knife, which will efficiently cut out silage or maize blocks with minimum power requirement, leaving a sealed face, which eliminates secondary fermentation. The McHale Block cutter is suitable for all front-end loaders and it is also available with a high lift frame, in a range of three sizes, for rear mounting. McHale block cutters are available in 1.3m, 1.6m and 2.0m.